Nothing in the House: PIE. 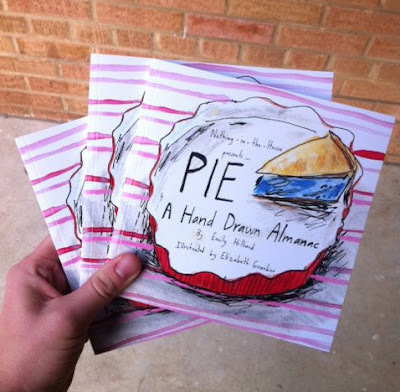 A Hand Drawn Almanac Out Today! PIE. A Hand Drawn Almanac Out Today! The books are here!!! And we're having a party to celebrate! Local DC friends, Elizabeth and I hope to see you tonight at Ginger Root Design from 5:30-8:30pm where will be selling the pie almanac, serving up glasses of mulled wine and slices of pie (spiced pumpkin sorghum, sweet potato speculoos, and Nutella icebox to name a few), and listening to jams by DJ Dianamatic! If you can't make it to pick up a book tonight, you can order them right here. Now off to party! Labels: cookbooks, pie art, PIE. A Hand Drawn Almanac, Washington D.C.